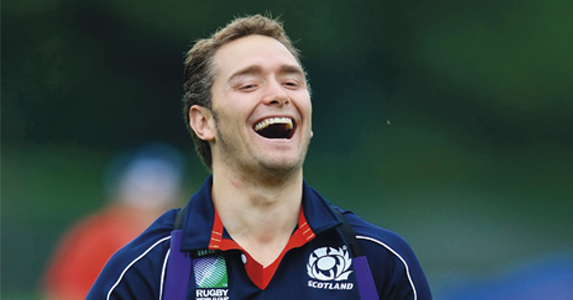 He made his Test debut on St Valentine’s Day 2004 and for the past seven years Dan Parks has been involved in a love affair with the Scotland rugby team, despite the fact he hails from the other side of the world. It’s not always been a happy relationship – Scotland fans have often vented their frustration by booing the stand-off and a succession of coaches have fallen in and out of love with him. But Parks has remained true to his nation and his team-mates and, by stomaching the abuse and coming back for more, has shown real commitment. Parks has another rugby love: the World Cup. He relished every second of the 2007 tournament and plans to do the same again in New Zealand this autumn. He may be setting out as second-choice No 10 behind Ruaridh Jackson, but Parks will be 100% committed to playing his best rugby when the opportunity arises and, as a self-confessed “positive person”, will be smiling throughout. Every player who made the final cut into their nation’s World Cup squad will be raring to go when their first game finally arrives after months of preparation. “Our training camp started back on 20 June and it was very intense,” says Parks. Parks kicked 13 points in the latter game and is confident of staging a strong challenge for the No 10 jersey, despite having lost his starting spot to Jackson for the last three games of this year’s Six Nations. “Every player wants to start every game, you always do, but sometimes the coach takes a different view and it’s one of those things you’ve got to accept. It’s very hard these days to have a proper pre-season of six to eight weeks of doing your fitness and weights work. The fixtures seem to give Scotland the ideal chance to get two early wins under their belts before seeking the crucial third victory to take them into the quarter-finals ahead of either England or Argentina, but Parks is taking nothing for granted. Parks, 33, hopes to keep playing after his two-year contract with Cardiff Blues runs out next summer and has no plans to retire from international rugby while he’s still lacing up his boots for the club game. His extended family still live in Australia, his current home is in Wales, he has many friends in Scotland – where he lived from 2003 to 2010 – and his girlfriend Laetitia’s family is in France, so Parks could end up on either side of the globe in the long term. “I’ve got no idea where I’ll be. I’m really enjoying what I’m doing at this stage. There is no better job in the world than playing professional rugby and I would like to do it for a few more years. This article appeared in the October 2011 issue of Rugby World Magazine.